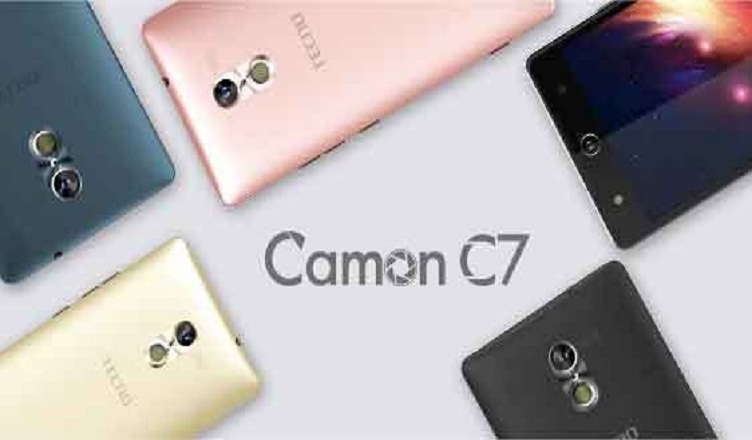 Tecno has launched the Camon C7 , a cheaper version of Camon C9. Tecno Camon C7 comes with a 5.0 inch touchscreen display with a resolution of 720 pixels by 1280 pixels at a PPI of 267 pixels per inch. The Tecno Camon C7 is powered by 1.3GHz quad-core MediaTek MT6735 processor and it comes with 2GB of RAM with 16GB of internal storage that can be expanded up to 128GB via a microSD card. Tecno Camon C7 packs a 13-megapixel primary camera with Dual Flash on the rear and a 13-megapixel Front Camera with Flash . The Tecno Camon C7 runs Android 6.0 Marshmallow and is powered by a 2500mAh battery. Tecno Camon C7 measures 142.1 x 71 x 5.4mm (height x width x thickness) . The Tecno Camon C7 is a dual SIM smartphone that accepts two SIM. Connectivity options include Wi-Fi, GPS, Bluetooth. Tecno Camon C7 is now available on www.kara.com.ng for #40,000 at the moment.